Trì tụng minh chú Om mani padme hum [Án ma ni bát di hồng] là một việc rất tốt. Tuy vậy, khi tụng chú cần phải nhớ nghĩ đến ý nghĩa của lời chú, vì sáu âm này mang ý nghĩa thâm sâu quảng đại vô cùng. Âm thứ nhất, OM, là tổng hợp của ba mẫu tự A, U và M, tượng trưng cho thân miệng ý ô nhiễm của người tụng chú, đồng thời cũng tượng trưng cho thân miệng ý thanh tịnh của Phật đà. Hồng Như chuyển Việt ngữ tháng 2 năm 2006. Soát bản dịch tháng 04/2006. Mọi sai sót là của người dịch. Mọi công đức sinh hồi hướng pháp giới chúng sinh. 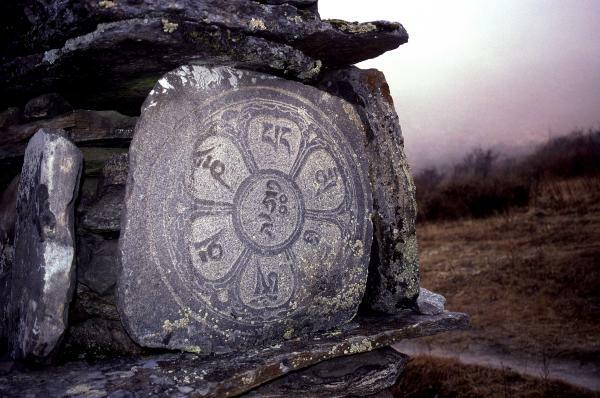 It is very good to recite the mantra Om mani padme hum, but while you are doing it, you should be thinking on its meaning, for the meaning of the six syllables is great and vast. The first, Om is composed of three letters, A, U, and M. These symbolize the practitioner’s impure body, speech, and mind; they also symbolize the pure exalted body, speech, and mind of a Buddha. Can impure body, speech, and mind be transformed into pure body, speech, and mind, or are they entirely separate? All Buddhas are cases of beings who were like ourselves and then in dependence on the path became enlightened; Buddhism does not assert that there is anyone who from the beginning is free from faults and possesses all good qualities. The development of pure body, speech, and mind comes from gradually leaving the impure states and their being transformed into the pure. How is this done? The path is indicated by the next four syllables. Mani, meaning jewel, symbolizes the factors of method-the altruistic intention to become enlightened, compassion, and love. Just as a jewel is capable of removing poverty, so the altruistic mind of enlightenment is capable of removing the poverty, or difficulties, of cyclic existence and of solitary peace. Similarly, just as a jewel fulfills the wishes of sentient beings, so the altruistic intention to become enlightened fulfills the wishes of sentient beings. The two syllables, padme, meaning lotus, symbolize wisdom. Just as a lotus grows forth from mud but is not sullied by the faults of mud, so wisdom is capable of putting you in a situation of non-contradiction whereas there would be contradiction if you did not have wisdom. There is wisdom realizing impermanence, wisdom realizing that persons are empty, of being self-sufficient or substantially existent, wisdom that realizes the emptiness of duality-that is to say, of difference of entity between subject an object-and wisdom that realizes the emptiness of inherent existence. Though there are many different types of wisdom, the main of all these is the wisdom realizing emptiness. Purity must be achieved by an indivisible unity of method and wisdom, symbolized by the final syllable hum, which indicates indivisibility. According to the sutra system, this indivisibility of method and wisdom refers to wisdom affected by method and method affected by wisdom. In the mantra, or tantric, vehicle, it refers to one consciousness in which there is the full form of both wisdom and method as one undifferentiable entity. In terms of the seed syllables of the five Conqueror Buddhas, hum is the seed syllable of Akshobhya – the immovable, the unfluctuating, that which cannot be disturbed by anything. Thus the six syllables, om mani padme hum, mean that in dependence on the practice of a path which is an indivisible union of method and wisdom, you can transform your impure body, speech, and mind into the pure exalted body, speech, and mind of a Buddha. It is said that you should not seek for Buddhahood outside of yourself; the substances for the achievement of Buddhahood are within. As Maitreya says in his Sublime Continuum of the Great Vehicle (Uttaratantra), all beings naturally have the Buddha nature in their own continuum. We have within us the seed of purity, the essence of a One Gone Thus (Tathagatagarbha), that is to be transformed and fully developed into Buddhahood. Lục Tự Đại Minh chú được làm thành file bảo vệ màn hình (screensaver) dươi dajgn 3D với rất nhiều kiểu chuyển động rất đẹp (thích hợp cho những người tu quán tưởng các chủng tự này) + âm thanh trì chú theo giọng Tây Tạng rất hay.